This is a recipe for a sausage egg cheese casserole, a make ahead breakfast casserole that is assembled the night before for a quick bake hearty breakfast the next morning. Easily feed a hungry crowd with this comfort food classic. Growing up on a farm in Kansas, opening day of pheasant season was treated like a holiday. Insulated clothing, orange hunting vests and guns in hand, my father, uncles and cousins would load up in the pickup and head for the fields. Fanning out across an acreage of harvested milo, the brigade would walk the rows milo stalks to flush the birds feeding on fallen grain. Many times during the next weeks, cars full of hunters would knock on our door to ask permission to walk our fields. With a fresh pot of coffee and homemade pies that my mom had assembled, the hunters would also reap the rewards of fresh country fare and conversation before heading out on the hunt. 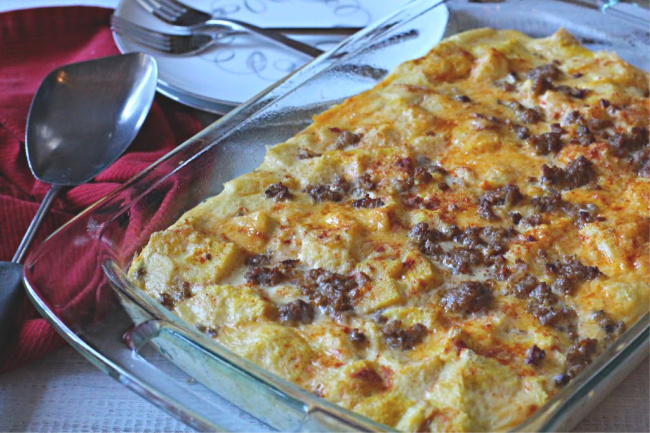 This sausage egg and cheese casserole recipe is one that my aunt would prepare in anticipation of feeding those hungry hunters. Some of them neighbors and some from nearby towns. It was a time to welcome old friends and meet new. 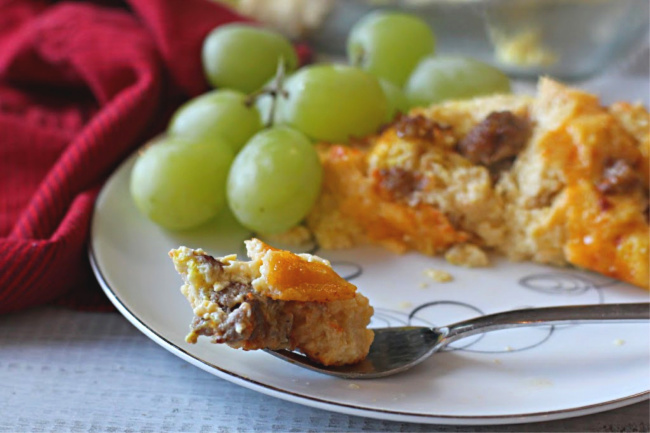 You don’t have to welcome pheasant hunters to appreciate this sausage and egg breakfast casserole. 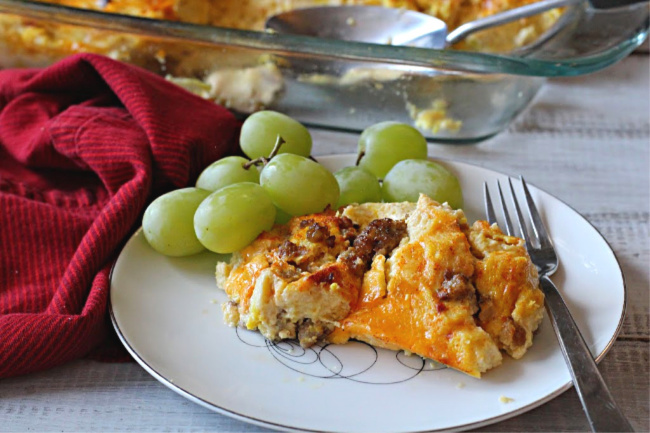 This overnight breakfast casserole will be perfect for the upcoming holiday season. Your guests will love the combination of flavors. Sausage, eggs and cheese resting on a bed of cubed white bread that’s been coated with mustard. 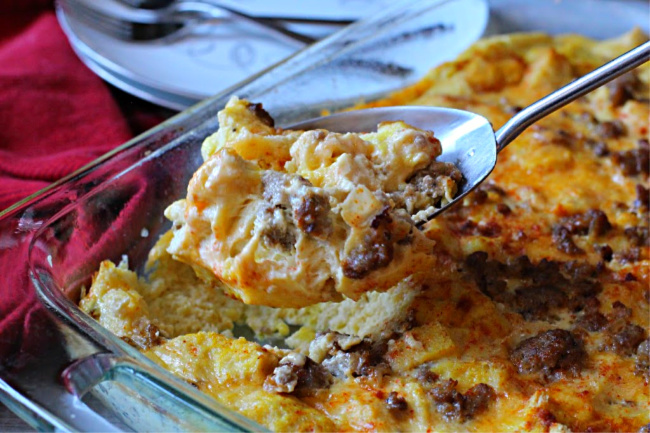 Use your favorite breakfast sausage for this recipe, we prefer Jimmy Dean Original. For me, it’s a perfectly flavored breakfast sausage. And perfect for making this Jimmy Dean Breakfast Casserole. You can also use ham in this recipe, a great way to use up some of that leftover holiday ham. You’ll need a 9 x 12 casserole dish. I use my Pyrex Baking Dish that I’ve had for umpteen years. It’s a work horse in my kitchen and I love that it has easy-grab handles … and it comes in a set of two. 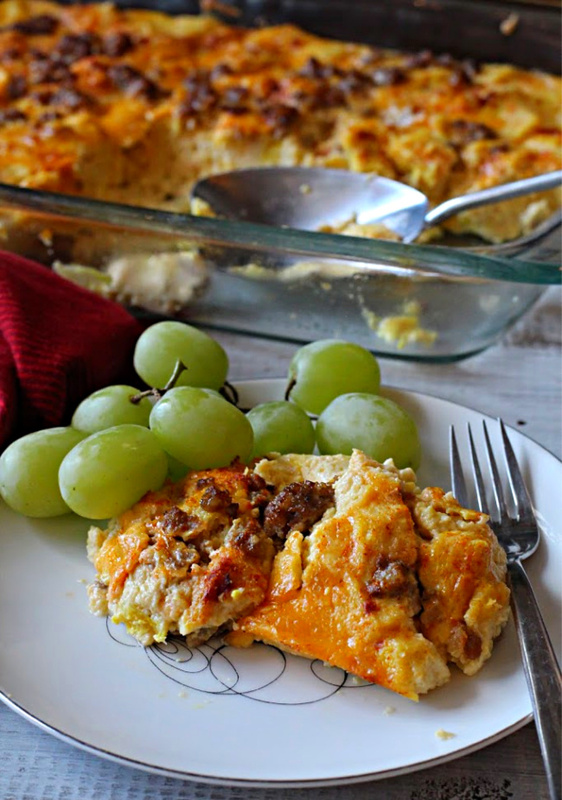 I hope you give this sausage and egg breakfast casserole recipe a try, and if you do, please come back and give the recipe a star rating, and leave a review in the comment section. I love hearing from my readers, yay or nay. And if you have a favorite overnight breakfast casserole recipe, let me know, I’d love to give it a try. 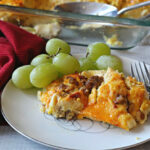 and this one I found over at Reluctant Entertainer, Slow Cooker Bacon Hashbrown Breakfast Casserole. Thanks Sandy, sounds delish. This is a recipe for a sausage egg cheese casserole, a make ahead breakfast casserole that is assembled the night before for a quick bake hearty breakfast the next morning. Feed a hungry crowd with this comfort food classic. Cook the breakfast sausage in a fry pan stove top. A few minutes before it's browned, add onions. Finish cooking for about 3 - 5 minutes or until onions are tender. Remove crust from 12 slices of white bread. I use white sandwich bread. This task is easier if you've frozen the bread. Spread each slice of bread (one side only) with a thin layer of mustard. Cut the bread in cubes. Place half of the crumbs in a 9 x 12 inch casserole dish. In a large bowl, beat the eggs and then blend in the following: milk, salt and Worcestershire sauce. Pour half of this mixture over the bread crumbs in the pan. Add half of the cheese. Add the remaining bread and then pour the remaining milk and egg mixture over. Add the rest of the cheese. Using the back of a spoon, press down to make sure the bread is coated. The next morning, using a roasting pan, place the casserole dish in the pan and place in oven. Carefully pour water into the roasting pan until it reaches about 1/3 of the way up the casserole dish. Bake at 350 degrees, uncovered, until inserted knife comes out clean, indicating the custard has set. Depending on your oven, this can take 40 minutes to an hour. You can also use ham for this recipe. Looks delicious Chef – If I come pheasant hunting at the ranch, will you make it for me. I love overnight breakfast casseroles. They always mean a celebration. Now you need to give us a pheasant recipe!